This potential distributor provides 8 0V channels for connection to external devices, and can accommodate an additional power contact. It can be used, for example, to provide a 0V ground to an external device near the slice I/O module. 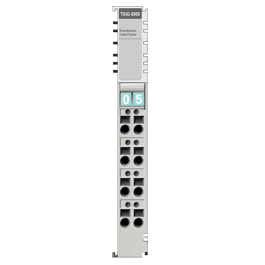 The TSIO-8005 provides 24VDC power and can be used as a complement to the TSIO-8004.